Back in 2008, Thermaltake teased the Level10, a concept chassis designed in partnership with BMW to commemorate the company’s ten years in the PC industry. Someone equated levels gained in a game to years lived and many backs were patted that day. This year is Thermaltake’s 20th, and they’ve not only redesigned the “Level” design language, they’re also kicking things off with a logo redesign, adding some more RGB kits into their products, pushing out a really sweet keyboard design, and debuting voice controls for their companion controller app. 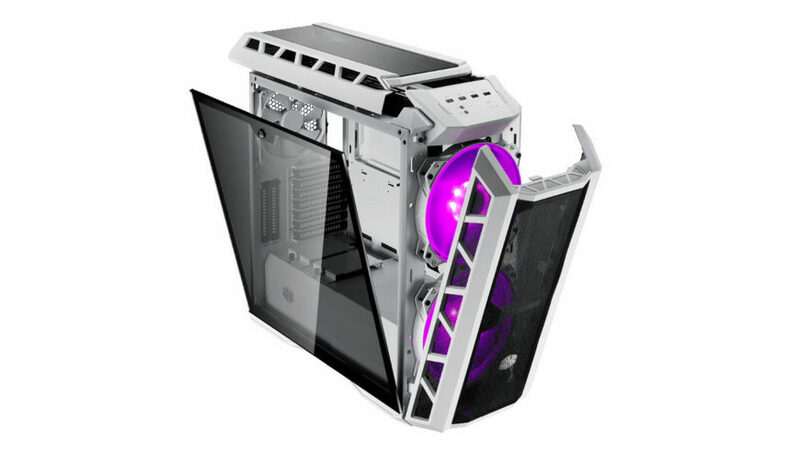 The Level20 is another compartmentalised case design, but it now includes three separate tempered glass penals that have their own hinges, more space for hard drives and SSDs, a compartment dedicated to watercooling setups, and a more modern front panel cluster. While it lacks the handle that made the Level10 somewhat portable, this looks a lot more premium thanks to a generous use of smooth aluminium, black plastics and the glass panels. It stands on four aluminium feet as well, raising it up off the floor. I’m left wondering how you keep this thing clean, though, or how you’re supposed to do hard loops and flat cable runs between the compartments. At the top you’ll find the power and reset buttons, 3.5mm microphone and audio jacks, four USB 3.0 Type-A ports and one USB 3.1 Gen 1 Type-C port. Front-facing Type-C ports aren’t that common, but I hope that we’ll see more of those this year with new chassis designs. The Level20 certainly won’t be cheap though, because it comes standard with three Riing Plus 140mm RGB fans, two Lumi RGB light strips, and a built-in Riing RGB controller. Riing and Lumi are their own ecosystems that belong to Thermaltake, so there’ll be no mixing and matching other RGB products from other brands. Pity. 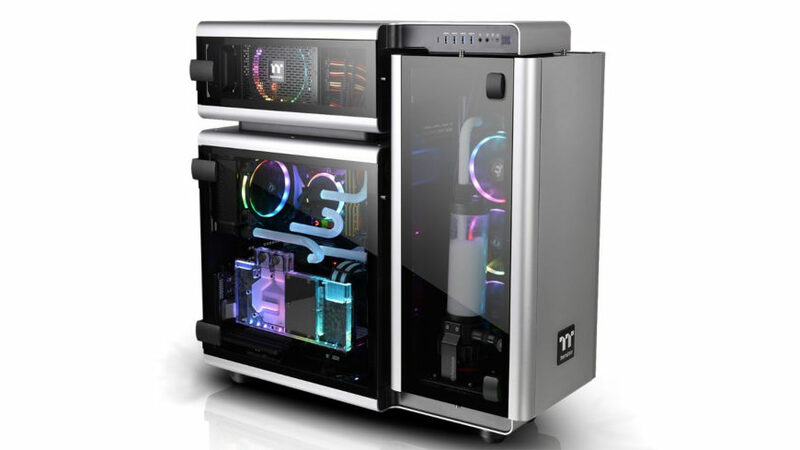 The Level20 and other products shown off at CES are part of Thermaltake’s new branding, which the company calls “TT Premium”. Premium might eventually just take over everything else they do and replace their current stack, but for the moment this is a brand kept separately for products that the company says represents “the passion in DIY, Modding and Thermaltake’s desire to be the most innovative brand in the PC hardware market”. The Premium brand is meant to be a high-end sort of lineup, dumping cheap plastics and fake brushed accents for the real McCoy. 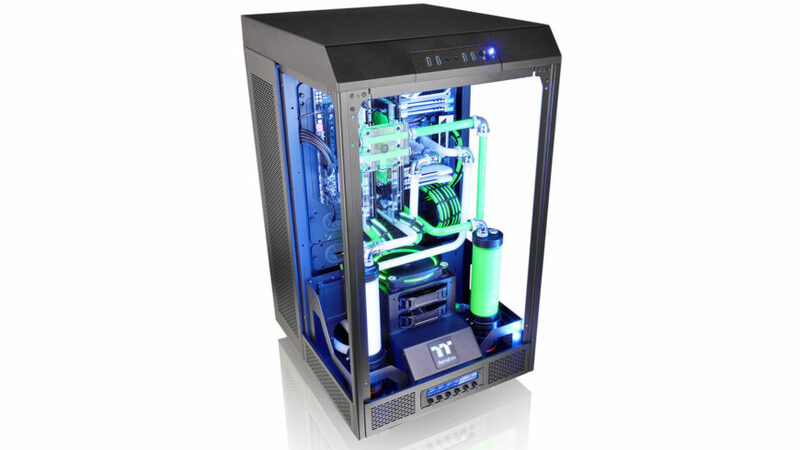 For years Thermaltake’s products had a reputation for being cheap and mostly plastic, and with TT Premium the company looks to be separating that legacy from something that they can design from scratch. I’m excited to see where this potentially leads. 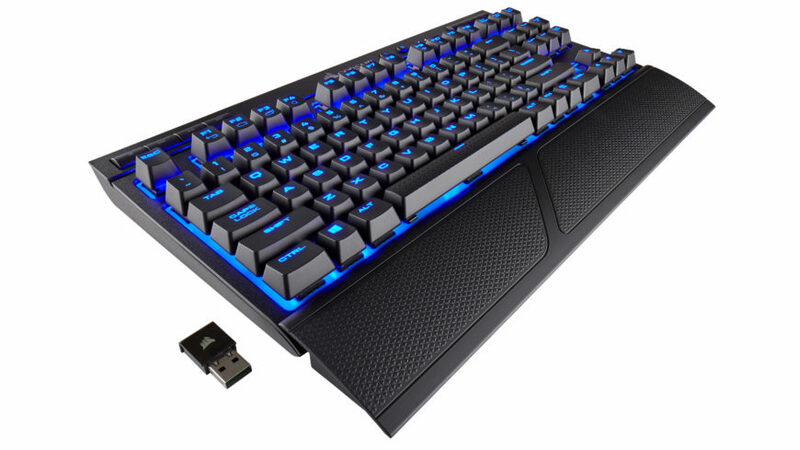 Thermaltake’s second TT Premium product is the X1 Mechanical keyboard. 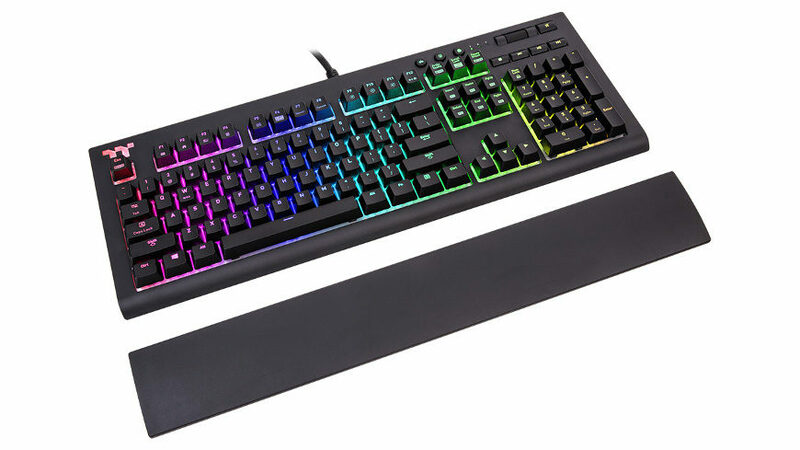 It’s a clean-sheet design that shares some characteristics from other keyboard brands like Logitech, notably the placement of the volume scroll wheel and the three function keys to control the lighting and game mode. In the past, Thermaltake had their initial mechanical keyboard lines that used Cherry MX switches, later moving to Kailh for most of their stock. The X1 makes a U-turn back to Cherry, and will ship with either a MX Blue Switch or the new MX Speed Silver, a modified MX Red design that has less travel and offers a shorter actuation point to register a keypress. It’s a minimal change, but one that will end up replacing MX Red switches due to its lower cost. 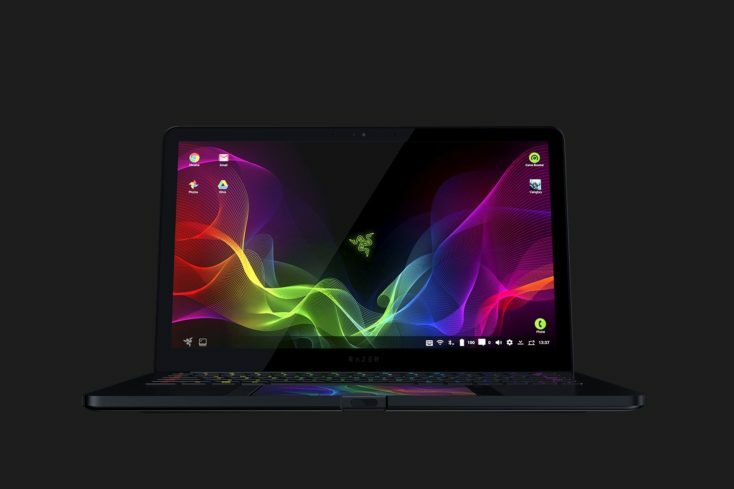 The X1 is fully RGB, includes a USB 2.0 pass-thru port for attaching USB thumb drives or a low-power mouse, a 3.5mm audio pass-thru, and comes with a magnetic wrist rest that comes apart easily. Wrist rests have always been these gimmicky things that offer no customisation or placement for comfort. With the TT X1, you can detatch the wrist rest and move it around a bit to figure out where you want it to go. Pricing is steep for both the Cherry MX Blue and Speed versions of the X1, set to retail for $129.99 and $139.99 respectively. 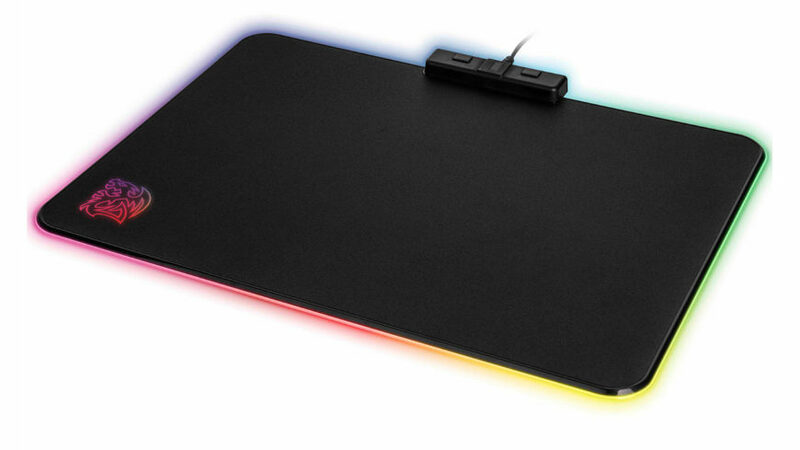 Another new product is the TT eSports Draconem Touch RGB mousepad. As the name implies, it’s got RGB lighting up the wazoo, but that’s not the only thing that makes this thing special. On the top of the mousepad is the RGB controller and two buttons to control some of the basic lighting effects. In the middle is an optional touch sensor that is a functioning fingerprint scanner for biometric authentication. Thermaltake says that the scanner is FIDO Alliance certified and works as a U2F device for signing into online banking, Windows Hello biometrics, and other related services that can use biometrics as a second form of authentication. These kinds of things are also typically Linux-compatible, so it would be interesting to see if this does work on Linux. Fingerprint scanners for desktop use are extremely clumsy and unattractive, so this would be a neat way of having Windows Hello integration on your desktop or laptop without sacrificing much in the way of aesthetics. 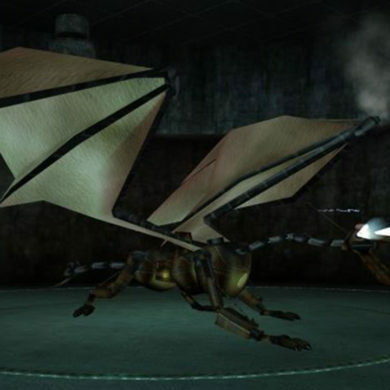 The sensor is manufactured by Synaptics. Thanks to these additions, it’s a rather expensive mousepad. At $49.99, I don’t think a lot of people will be buying one, but if you were looking for a proper fingerprint scanner for Windows Hello functionality, this might not be a bad idea. Your RGB fans, now with Artificial Intelligence. Well, kinda. 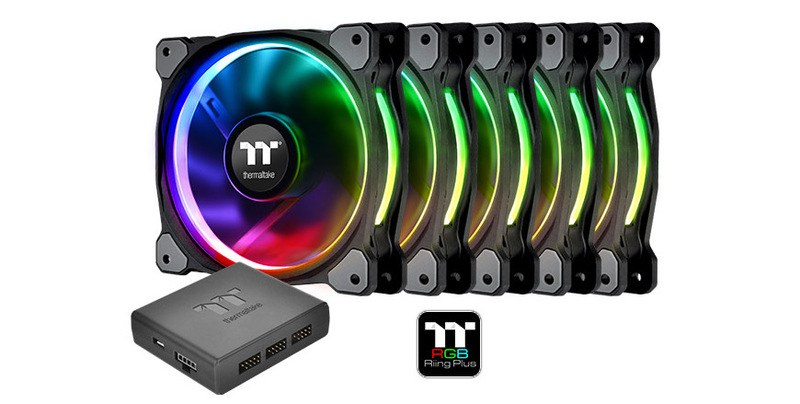 TT Premium is adding another new product to Thermaltake’s offerings with the addition of the TT RGB Riing Plus, a kit of five fans in either 120mm or 140mm sizes, with an additional RGB controller that can communicate wirelessly with Thermaltake’s Riing Plus RGB app available on the Apple iTunes and Google Play stores. The Riing RGB Plus controller hooks up to a lot of different devices, including the Riing fans, Thermaltake’s Pacific RGB waterblocks for graphics cards, a selections of pumps and reservoirs, a massive 360mm radiator, and LED light strips under the Lumi brand. The AI part comes in for RGB Riing Plus owners who also have an iPhone, iPod Touch, or iPad and run version 1.1.5 of Thermaltake’s software. Using Siri’s built-in voice recognition APIs, you can talk to the Riing Plus RGB app and control your lighting effects by voice alone. It’s gimmicky, but sounds fun.  There were a few new products shown at CES 2018 that were also interesting, but I took more interest in Thermaltake’s new range of gaming chairs.  After getting a new chair myself this past Christmas, I found myself thinking more about the ergonomics of my sitting down for several hours in the day, and I’d like to get one of these gaming chairs eventually to see what the fuss is all about.